With recent scrutiny of moorland management practices, research into muirburn has been given a new lease of life. 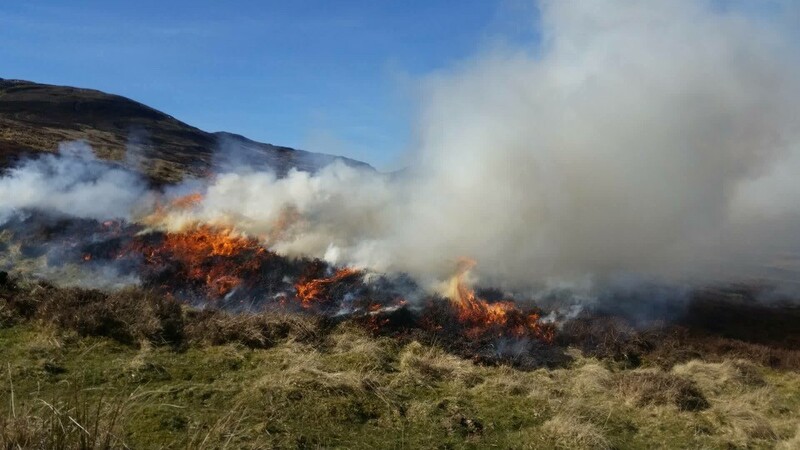 This review by Rebekah Strong of Scottish Land & Estates will focus on some of the most recent studies on the impact of muirburn on carbon storage in peatland. Muirburn is the intentional burning of moorland to remove the top layer of vegetation. Burning targets tall, woody patches of heather to allow for new growth. Burning takes place in cycles of up to 20 years, with small patches burnt at different times then left to regenerate. This creates the patchwork hill sides we see around Scotland, providing food and shelter for game and moorland birds, helping improve the wild populations. Burning of the natural environment can appear extreme and high risk, but rigorous training and guidance ensure fires rarely burn too hot or get out of control. Nevertheless, there is some concern around this management practice, especially on peatland. Mounting pressures from climate change is causing worry that burning peatland vegetation will release more carbon into the atmosphere. Previous evidence suggests that burning is detrimental to the levels of carbon stored in peatland and fire can spread to the surface layer of peat and cause carbon to be released1. However, recent studies show a more positive impact of muirburn on peatland carbon storage. Professor Marrs and colleagues explored the carbon capture rate in long-term experimentally burnt peatland2. The study examined the impact of different burn frequencies (0 – 6 burns) over 53 years. Carbon storage and peat generation continued to occur regardless of burn frequency, albeit at a decreasing rate with increasing burns. Another study by Heinemeyer and colleagues investigated the carbon storage of peatland over centuries looking at sediment cores3. The three blanket peat bogs analysed all showed that carbon was stored during periods of burning. The level of carbon was shown to positively correspond with burn frequency, unlike that of the previous study. Charcoal formed by burning was seen as an important factor in peat carbon levels. In this form, carbon is more stable and takes longer to decompose, preventing it from being released into the atmosphere. This study does not however make comparison to unburned sites, so it is difficult to make robust conclusions. Peat is formed when plant material is not fully decayed, due to a lack of oxygen in boggy habitats. Sphagnum moss and cottongrass are two of the main species which turn into peat. Whitehead and Baines investigated the impact of muirburn on the species present on peatland4. They found that Sphagnum moss and cottongrass were most common within 3-10 years after a burn, before the heather could re-establish. Milligan and colleagues found a similar result, showing that muirburn allowed more peat-forming species to grow5. An experiment by Grau-Andrés and colleagues showed that the temperature of the fire was shown to have no effect on the regrowth of Sphagnum moss and cottongrass6. However, an investigation by Noble and colleagues showed the opposite effects, with Sphagnum and cottongrass species appearing more vulnerable to high temperatures7. The Game & Wildlife Conservation Trust also this week published a summary of the impact of muirburn aiming to make the science more accessible to its members and the wider public. This article summarises the findings from the long-term study of burning practices at Moor House National Nature Reserve. Too frequent muirburn appears to have a negative effect on peat accumulation and carbon storage. Sphagnum moss and cottongrass cover is seen to benefit from regular muirburn every few years, and a similar positive effect has been noted for biodiversity. An ideal burn frequency of every 20 years is recommended for the specific deep peat site studied long-term in the Pennines, with some areas left unburnt. Other moorland areas could benefit from different intervals between burns due to the varying depth of peat in different areas. This would minimise the decrease in carbon storage rates and maintain high biodiversity. It would also provide some protection to the increasing risk of wildfires. Muirburn offers a way to reduce fuel load for wildfires on peatland, preventing uncontrolled burning of the peatland and substantial release of carbon. With muirburn we could quite literally fight fire with fire! While the concerns around the muirburn management technique are valid, the key is balance. Muirburn has shown positive effects on peat generation and carbon storage but overdo it and that could all be lost. With the new push for informed, evidence driven management practices, we can both have our cake and eat it. That is to say, peatland can be regenerated, carbon can be captured, and the hunt can still go on. Glaves, D. et al. The effects of managed burning on upland peatland biodiversity, carbon and water. (2013). Heinemeyer, A., Asena, Q., Burn, W. L. & Jones, A. L. Peatland carbon stocks and burn history: Blanket bog peat core evidence highlights charcoal impacts on peat physical properties and long-term carbon storage. Geo: Geography and Environment 5, e00063 (2018). Whitehead, S. C. & Baines, D. Moorland vegetation responses following prescribed burning on blanket peat. Int. J. Wildland Fire 27, 658–664 (2018). Milligan, G., Rose, R. J., O’Reilly, J. & Marrs, R. H. Effects of rotational prescribed burning and sheep grazing on moorland plant communities: Results from a 60-year intervention experiment. Land Degradation & Development 29, 1397–1412 (2018). Grau-Andrés, R., Davies, G. M., Waldron, S., Scott, E. M. & Gray, A. Increased fire severity alters initial vegetation regeneration across Calluna-dominated ecosystems. Journal of Environmental Management 231, 1004–1011 (2019). Noble, A. et al. Prescribed burning, atmospheric pollution and grazing effects on peatland vegetation composition. Journal of Applied Ecology 55, 559–569 (2018).